As many of you maybe aware, on every Thursday on Radio Sai we have Live programs from our studios. This endeavour began on May 17, 2012 (Thursday Live Archives). And like in other radio stations these programs are hosted by Radio Sai team members during the entire day. One such segment which was hosted by Team Radio Sai's Aravind, in the afternoon of June 7, 2012 was a unique interview with Swami! Presented below is the edited transcript of this Live programme. 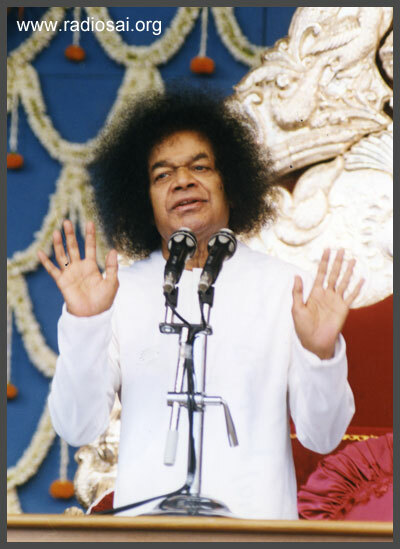 Sairam Dear Listeners on this warm Thursday afternoon. I am so excited today because there is something very special - more special than you can ever imagine - coming up today. Just now, we have received information that Swami is on His way to our studios! It was sometime in 2006 when the senior-most students of Baba’s college wanted Swami to visit the hostel. It had been more than a year since Swami had sustained a fall and used to move around in the car and wheelchair. And so, when the students put forth their request to Him, He replied that there was no way He could come to the hostel as there were only steps at the entrance and no ramps. This was taken up very seriously by the boys along with their teachers. Soon, the steps leading to the hostel were replaced with a smoothly graded ramp. The idea was that Swami would be able to easily drive into the hostel in the car itself. When this was informed to Bhagawan, He seemed to doubt the fact that a car could enter the hostel in the way the students were telling Him. This motivated the students to take another very interesting step. They got hold of a video camera and filmed the hostel van entering the hostel via the ramp. They also filmed the sufficient space that was present on either sides of the car. The video was then processed and loaded onto a laptop which was cleverly ‘concealed’ in a card that was made to invite and welcome Swami to the hostel. He seemed pleased and said that He would come. In fact, so much was His joy that He told many people that special ramps and a welcome had been arranged for Him in the hostel. And the way He came to the hostel was unforgettable in itself. One fine morning, as all the students were having breakfast, a siren was heard. 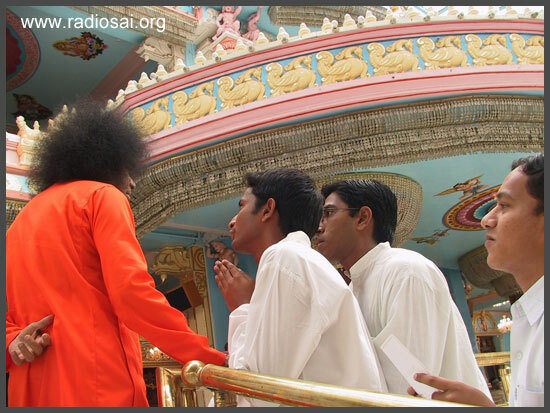 Immediately, everyone understood that Swami was coming and they all rushed to the road to have His darshan. Maybe He was going out for a round of the town, as had become a regular feature those days. However, as Swami’s car neared the hostel gate, the right indicator lights of the car began to blink. It was with a joyful surprise that everyone realized Swami was really coming to the hostel! The dining hall was cleared in a hurry and all the plates with breakfast in them were shoved to a side. Swami’s car entered the hostel and then moved into the dining hall which was also the prayer hall. Swami blessed all the residents of the hostel with His darshan and spent about 5-10 minutes there before leaving. The Lord’s arrival is always a story in itself! And now, even as Swami is about to arrive, let us welcome Him with a welcome song. This tune is not an ordinary one. It was the song through which Radio Sai welcomed Swami in its first ever broadcast. The story of Radio Sai began with a visit of Dr. Noah Samara, Chairman and CEO of WorldSpace, to Bangalore sometime in September 2001. While in Bangalore, Dr. Samara heard about Swami's Super Speciality Hospital. He just could not believe that a Tertiary Care Hospital offered treatment completely free; he had to see it for himself and convince his eyes that indeed there was such a hospital on the face of the earth. He went, he saw and he was bowled over. Inevitably he made the pilgrimage to Prasanthi Nilayam, and on the spot offered free a radio channel on AsiaStar satellite of WorldSpace. Hectic preparations followed and on November 23, 2001, Dr. Michael Nobel, Member of the WorldSpace Board, formally offered the radio channel to Swami. Michael Nobel is the grandson of Marta Helena Nobel-Oleinikoff. He is the great-grandson of industrialist and humanitarian Ludvig Nobel who is the brother of Alfred Nobel - the great man who has instituted the Nobel Prizes. 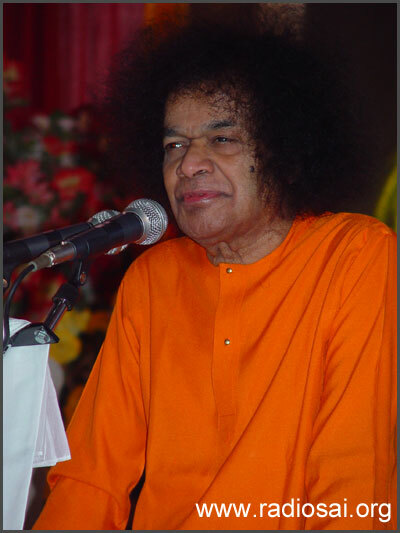 Speaking on that occasion Dr. Nobel said that if Swami's Message of Love could travel so far and wide by sheer word of mouth, how much farther would be the reach via a 24-hour radio service. On Dr. Nobel's request Swami pressed a button, and presto, the huge birthday crowd in Sai Kulwant Hall heard the specially recorded Inaugural Program. Yes, Radio Sai was now a reality, sharing the same Birthday as the One Whose voice it carried. 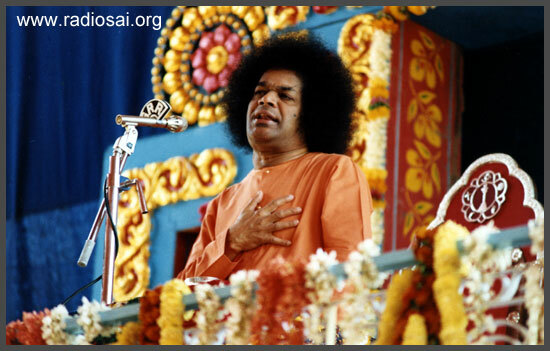 It was then a small step; since then, with Bhagawan's Grace, Radio Sai has made big leaps! Q) Welcome to our studios Swami. We are filled with so much joy and thrill today. This Thursday has really become Guruvaar for all of us. I just do not know what to say. We always know that You are here with us but today, having You here for a question and answer session feels very special. Senses are like life principles for every man. Once you rein in your senses, your life will be peaceful. You should not only avoid evil talk; you should also talk less. Your speech should be short and sweet. Sages like Valmiki and Vyasa and great devotees like Potana composed sacred texts and sanctified their lives. Emulate their ideals and make your life exemplary. Read sacred texts composed by such noble souls. Today, people read books that pollute the mind. It is a very bad practice. Be it reading, writing, seeing, or talking, let everything be good. Do not commit any mistake knowingly. You can experience Divinity in humanity by putting the senses to proper use. One can visualise the divine manifestations and become divine oneself only through sacred use of the senses. This is due to the perversion (vikruti) in the world (prakruti). We are striving for happiness in the worldly matters. Buddha struggled hard for bliss in spiritual field. That is real happiness. That is true happiness. That is permanent happiness. That is eternal bliss. That is immortality. Love is the life of everything. When we want to experience love, we should make our senses sacred. See no evil; see what is good. See good. Never see bad. Talk good. Never talk bad. Buddha called it as good vision. Develop a good vision. Buddha visited many elders. He studied sacred texts. He did spiritual practices. He felt, “What is the use of going through all these?” These are all the facets of the worldly ways. He kept aside the books. He discontinued visiting elders. He also stopped listening to their teachings. He resolved to fructify the five elements that the Lord had gifted. He thought “If I cannot sanctify the five elements thus, what spiritual practice is worthy?” The body is bound to decay and fall one day. Whatever done with the body is fleeting. The body which is temporary gives you only temporary things. But practices pertaining to that which is eternal and true will remain always. It was then that Buddha started controlling His senses. When He made efforts to control the senses, His bliss kept growing by the day. Bliss overflowed from him. He was unable to even bear the bliss. Whatever we are doing are all mistakes. But you seek forgiveness. One should never desire forgiveness. One should desire the suitable punishment for the mistakes done. Then alone we will be freed of the mistake. If anyone commits a mistake, he is imprisoned. It is only to atone for the mistakes that one gets punishment in jail. Once the punishment is complete, the person is released. In the same manner, when we atone for our mistakes, we are freed. If you want relief, you should face the consequences of your mistakes. And ensure that you do not repeat the mistakes. We should exercise control over the senses. We commit many kinds of sins. But we are not considering them as sins. We think that these are but natural to us. That is not so. Q) So no sin done is escapable and one has to pay for one’s actions. That is what is called karma. Swami, is this karma in effect all the while or is it random? I mean, if I misuse my senses, how will I suffer? While considering the five senses, vision is very powerful. The eyes contain 40 lakh light rays. We have been wasting these light rays in many ways. So, the human body is decaying day by day. All our looks, all our pleasures, all the effects, are responsible for reducing the life-span of man. Every time you have a bad-look, many lakhs of the light rays in the eye are damaged. That is the reason why one develops eye-defects. People think that it is a cataract and undergo medical treatment and taking medicines. In the doctor’s opinion it may be a cataract but in reality this is the effect of a bad vision or bad looks. This effect of bad looks is what affects the eye and becomes eye defects. So, we have to control our vision. Q) Nobody ever taught us in that manner Swami. This is something medical science too can benefit from - the eyes get ruined not only through age or accidents but even due to bad sight and vision. Is this the case only with the eyes? The same must happen with other senses also, is that right Swami? The second one - Tongue. The tongue has more than three lakh taste buds - three lakhs. We get addicted to the various tastes and get lost in their enjoyment. Thus we lose the powers the tongue is capable of. It is not that we use the tongue only to eat tasty things, we also utter useless words. We hurt others. We use harsh words to injure our fellow beings. In this way, the tongue cuts short the life span. In the same way, every one of these senses is losing its powers due to overuse and over indulgence. This in turn is reducing life span. To begin with, we should control looks and taste. When we control these two, a new kind of power emanates. Whatever penance you may do, the power can be increased only by exercising control over the taste, sight and words. We very often are mistaken. We think that after all they are only tiny words and speak recklessly. The person you consider as the other is in fact not another person. In the other also, you are present. The bodies may be different but the Spirit is same in all. The one who is pained and one who causes pain are the same. So, we should not speak in a manner that hurts. Therefore Swami tells us 'Talk Less'. But you neglect that teaching. It is in the future that you will realize the hazards of talking too much. Q) Swami, it is only Your infinite love that You correct us and teach us. Even if You have to repeat the same things a million times over, You do it so that one day at least we listen. What can I say Swami? On behalf of everyone in this world, I offer my loving salutations to You. Bhagawan, You have so lovingly granted us this much of Your time. Before You leave, I have one last question. Anger is something that all of us suffer from. How can we control senses when we are unable to keep anger in check? What should we do when we get angry? Whenever bad qualities like anger and jealousy crop up in you, do not be carried away by them. Control them. Keep telling yourself, "Anger is a bad quality. It will lead to bad actions and ultimately put me to ruin." Whenever you are angry, sit quietly in one place and drink cold water. Chant the Divine Name. Then your anger will gradually subside. If your anger persists, go to a place of solitude and walk briskly for half a mile. Thus, there are many easy paths to control one's anger. But the youth today are not making any effort to control their anger. Whenever they get angry, they take it as an opportunity to hurl abuses at others. It is the worst sin. Through prayer and contemplation on God, you should try to control the evil qualities in you. Swami we have no words to express our gratitude. You have dispelled our doubts like the light that enters a room, and scatters in a moment the darkness that inhabited it for ages. We offer our Koti Pranams at Your feet Bhagawan and plead that you bless us with more such sessions. Jai Sai Ram. (These audio clips were from the Divine Discourse delivered on July 5, 2001).